The year 2016 revealed that we at Sounds Serious not only sound serious; our boutique PR firm racked up some serious successes among the wide variety of tasks we completed for clients, old and new, last year. Using a highly non-scientific process, we went back through every month of that year to review what kinds of business writing and PR consulting we completed. All year, client satisfaction was our main objective. What follows are some highlights of how we achieved our successes in 2016. In January, we were quite busy at the European Gas Conference providing beat reporting coverage for one of our best clients in the last 6 years, Natural Gas Europe. It was a real treat to work with their new editor after copyediting and proofreading our own articles for so many years. The website, which was solely devoted to European natural gas affairs like diversification, geopolitics, infrastructure, environment and gas diplomacy, has recently expanded its coverage to the global gas scene and is now called Natural Gas World. Here’s a link to the story we’re most proud of out of the 3 days of coverage, an interview with renowned gas thinker Jonathan Stern on the state of the natural gas market in 2016. KPMG in Hungary came on strong with a load of copy editing and corporate risk reviewing tasks for its IT Risk Advisory Consulting practice, which put out a dozen or so factsheets at the beginning of the year, and we even proofread every page of text for the Hungarian firm’s new website. Meanwhile, throughout the year we also reviewed a client newsletter called Question Marks for KPMG’s Professional Practice Department. It was also a good year for doing voiceovers for startups. One great engagement we received was from a company called KeyTiles, a specialized system for the measurement, processing and visualization of online content consumption. Our contribution was to copy edit the text and provide the voice to a series of explainer videos that the company uses to market its software to potential clients and provide support to users. For jobs like this one, we are convinced of the importance of hiring, not only a native English speaker, but someone with extensive experience in broadcast production (and voiceovers). If you’re interested, read (and hear) more about our “American Voice Talent” services. Throughout the year we did the risk reviewing the Fraud and Corruption Newsletter for KPMG’s Forensic practice in Central & Eastern Europe (CEE). It’s a really interesting read that gives a concise overview of the struggle against corruption in our region. They also had us devise social media texts for their “Profile of a Fraudster” survey in CEE. We also edited “tax cards” for KPMG practices in Bulgaria, Slovenia and Lithuania. “Company Interviews” are one of our specialties at Sounds Serious, so one of the tasks we enjoyed most this year as internal communication specialists was conducting Q&A sessions with various KPMG experts from around Central & Eastern Europe. Topics included the firm’s Business Intelligence Executive Survey and an interview on training actuaries. Such interviews are always a great opportunity to learn something about the various areas of business covered by Big4 firms and their specialists. March was a busy month with Natural Gas World which was involved in a series of outreach events with the GasNaturally lobbying organization in Brussels to orchestrate a series of events that promote gas and highlight aspects of the business that are in rapid flux. Read our reporting on the first event in Brussels in this piece entitled “Energy Union Depends on Efficiency and Security.” Our participation in a second event that month involved the authoring of a feature article on natural gas as a complement to renewable energy: “Recognizing the Gas and Renewables Partnership.” We also did a series of live live Tweets from these events. Later on, in addition to training our KPMG colleagues in the international network’s marketing risk management policies, all year long we reviewed the CEE People, Performance and Culture (“PPC”) newsletter and edited publications like the KPMG Golf Participation Report, as well as associated collateral like press releases for the rollout of such publications. We also reviewed KPMG’s most recent progress report on EU funding in Central & Eastern Europe, as well as composing a “PR toolkit” for it that included a press release, web text, client cover letter, and social media texts. Sounds Serious managed to gain a number of new clients in the summer and fall. One new client this year engaged us to do extensive broadcast media research in Central & Eastern Europe for a potential investor. We also devised an online PR campaign for a company dealing with European citizenship. Then, we did voiceover recordings to accompany a newly published English-language textbook, and helped the publisher produce recordings with a variety of native English speakers. Later in the summer, a regional PR agency in Central & Eastern Europe, Uniomedia, had us review the English language website of the local Coca Cola franchise. One particularly fun job was performing a variety of voices for a full-length animated feature film that’s being produced by an old artist friend of ours. By the end of the year, in addition to work from our main clients, we did a website review for an international meat manufacturer, a job we received from Wunderman Budapest and have begun a relationship with Landscape Communication Kft. to copy edit the company’s thought leadership pieces like this one. Special thanks to all of our clients and partners for a successful 2016. We look forward to working with you in 2017! 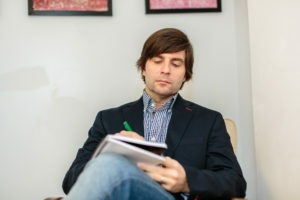 A corporate communications specialist, Drew Leifheit is the owner of Sounds Serious, a boutique PR firm in Budapest offering PR consulting services to clients throughout Central & Eastern Europe. Customer satisfaction is our highest priority! Frustrated by trying to find good freelance writers! Where are they hiding?